Creative concepts' store is a long-term project for interdisciplinary work, founded by a group of artists and practinioners working in the field of contemporary arts. - Creating and producing of own artistic projects in the field of performing and visual arts, fashion design and their boundary forms. - Building up of an alternative educational programme for artists and practitioners: workshops, lectures, research projects etc. - Creative exchange of ideas and points of view. - Research of artistic processes and practices. The core of the project plans and actions of Бbrain Сstore Пproject are artistic interventions, leaving besides the halls predetermined for art presentation and involving the "everyday-audience" into an unostentatious, spontaneous cultural context. With its politics of non-elitarism, openness and sociability towards collaborations with contemporary artists, Бbrain Сstore Пproject aims the building of partnership networks of personalities, groups and institutions. 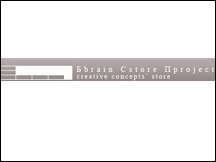 Creative concepts' store was founded in January 2004 by the performing artists Willy Prager, Mila Odajieva, Stephan A. Shtereff, and the designer Neli Mitewa. Based on their common work and the realisation of own and co-productions with local and international artists, the initiators of Б brain С store П project decided to collaborate in the search of a contemporary interdisciplinary language.